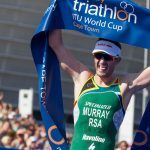 South Africa’s Henri Schoeman secures his first ITU title leading almost the entire race at the 2014 Tongyeong ITU Triathlon World Cup. USA’s Ben Kanute and Tommy Zaferes were with Schoeman all the way and also mount their very first ITU podium. 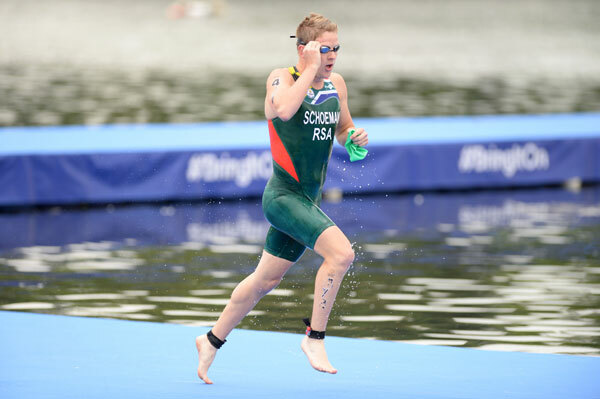 Schoeman began the race with an impressive swim posting the fastest time of the day with 16:19. A pack of five broke away early on the bike containing all three medallists, pulling further and further away from the rest of the field. “It’s unbelievable. I feel so great. It’s fantastic. We started off really well, working well together (on the bike). We kept it smooth. We were all working for the same thing – a breakaway. It was really encouraging – every lap we could see we were just gaining 20 seconds at a time. It was really encouraging and it pushed us even harder. 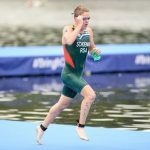 “It played into our hands, it made me run a little more comfortable, not exerting myself too much,” said Schoeman. Schoeman and Zaferes led the way on the run, until a big push in the final stages saw Kanute pull back for the silver. But there was no mistaking that today the gold was for Schoeman. “I was feeling great the whole run. 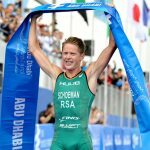 On the last lap when I looked over and I had a huge gap, that’s the best feeling in the world because then you can win comfortable,” said Schoeman. The large men’s field of 73 athletes began the two lap swim in glorious conditions for a non-wetsuit swim. 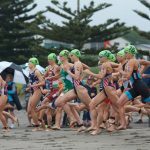 Zaferes, Schoeman and Anthony Pujades (FRA) were the first to emerge from the water on the first lap with Kanute and Wesley Matos (BRA) close behind. Jumping onto the bike first was Pujades, Zaferes and Kanute. A couple of seconds separated them between Schoeman and Tayama with Peter Denteneer (BEL) and Alexander Bryukhankov (RUS) close behind and a further couple of seconds until the main field. On the first lap of the bike Bryukhankov had to withdraw with a puncture leaving the field without the number one bib. With Bryukhankov out and Denteneer dropping off the pace, the first lap of the bike saw the leading five containing Pujades, Zaferes, Kanute, Schoeman and Tayama push ahead by a full minute on the chasing pack. By the second lap, the leading five had put one and a half minutes daylight to the giant chase pack of 52 including David Hauss (FRA) and Joe Maloy (USA). The leaders continued to work together steaming ahead with a lead of two and a half minutes by the time they reached T2. On the first lap of the run Zaferes, Schoeman and Kanute were running head to head. Pujades fell off by just over ten seconds with Tayama also dropping almost a minute off the pace. By lap two Zaferes and Schoeman had gone out ahead leaving Kanute 10 seconds behind. With Pujades still holding fourth, Hauss and Vicente Hernandez (ESP) were beginning to close down the large deficit, now just a minute and a half to Pujades. On the third lap Schoeman made his move on Zaferes gaining ten seconds by the end of the lap with a further ten seconds to Kanute. Schoeman maintained his lead throughout the final lap, but the battle for silver and bronze was not over between Zaferes and Kanute. With Zaferes in sight, Kanute put his head down for one final surge overtaking his fellow countryman and finally taking silver by a convincing six seconds over Zaferes who claimed the bronze. Kanute came sixth in the Under23 ITU World Triathlon Grand Final Edmonton this year, but silver in Tongyeong is his best result to date. “It couldn’t have worked out any better (the bike breakaway). We were working like we were on a team trial. We ended up putting a huge gap on the field, so it was good. “It was the exact opposite on the run. I could see them coming the whole time and I was getting a little nervous there towards the end. My stomach was starting to cramp a little. I was trying to run my own race and stay within myself enough so that I could close it. I ended up being able to put in some good efforts on the uphill and relax a little on the downhill. It was a strange year up and down all year, and it’s great to end it on a note like this,” said Kanute. Zaferes was more than satisfied with his bronze medal and happy to be fighting fit. “That couldn’t have been any more perfect. We worked together on the swim. Then on the first two kilometers of the bike we absolutely hammered it. The five of us were together. We had Bryukhankov, but he got a flat. We were trying to decide if we should wait for a few more people and decided to just go. Team time trial the entire time, nobody missed a pull, it was 1:20, 1:40, then two minutes. “At PATCO champs I ended up having a heat stroke and two seizures and was in the hospital five days. They were surprised I was even alive, so I’m happy to be alive, happy to be training again. Joel Filliol, my coach, has brought me back and been encouraging the whole time. I couldn’t have done it without him,” said Zaferes.